The Patient Empowerment Program considers the impact of cancer on the whole family. In addition to providing ample support to our breast cancer patients, we provide a Spouse’s Network for patients' partners. We also have the Teen Clique as an option for teens and young adults where the kids of some of our patients volunteer to be available to other kids in the same situation. As part of the Patient Empowerment Program, we give our patients a packet of referrals to retreats, services and exercise programs to support them and their families. One such program is Camp Kesem that has been “Giving Kids the Opportunity to Be Kids!” Since 2000, Camp Kesem has given children affected by a parent’s cancer the opportunity to just be kids. Several of our patients at Aesthetic Plastic Surgery, PC have taken advantage of this opportunity and are very grateful that this unique experience is available to their children...and got an added bonus of some time to themselves. Camp Kesem is a nationwide community, driven by passionate college student leaders, supporting children through and beyond their parent’s cancer. The student-run organization provides a free, weeklong summer camp for children (ages 6-16) affected by a parent’s cancer. Activities like sports, arts and crafts, and drama give campers a fun-filled week. Campers also participate in “Cabin Chats” with fellow campers and counselors, giving children the chance to share their experiences with each other. There are plenty of laughs and lots of emotional support, but Camp Kesem does not provide therapy. The tremendous fun and support campers experience is what makes Camp Kesem a transformative, magical week for campers and counselors alike. One charming young man, Daniel, aka ZEP, his chosen name at Camp Kesem, agreed to be interviewed just following his weeklong experience. At age 9, he has a very warm personality, is quite articulate and open with his feelings. When his parents, Marie and Tim, initially approached him about this opportunity, Daniel thought it might provide the chance to help him deal with all of the emotions he has experienced since his mom’s diagnosis…a chance to express them to other kids who had similar experiences…a chance to just get away from everything. Prior to camp, he had not shared his feeling with anyone. 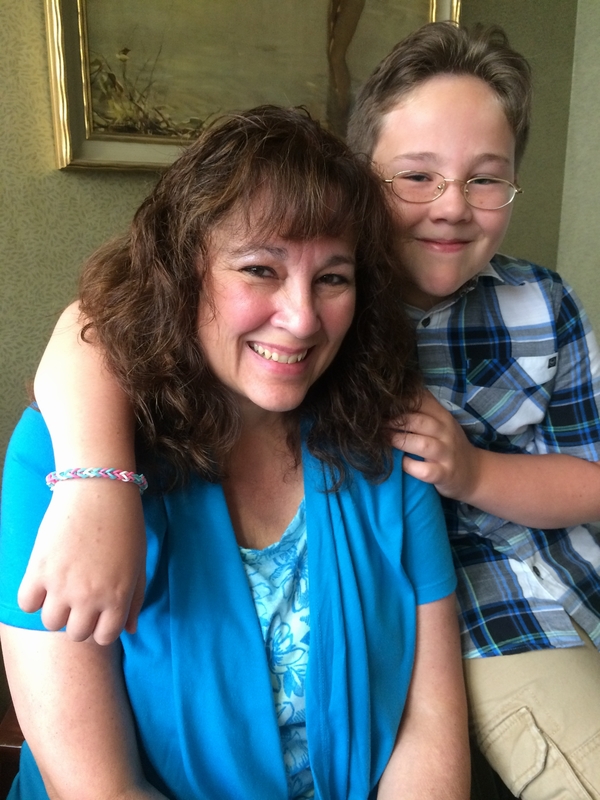 Daniel stated that when his mom was first diagnosed it was initially “crazy” but improved as she healed and now describes life as “back to normal.” During this process, he describes trying to distract himself as if nothing had changed. He described the counselors and campers as very supportive and welcoming and there was great ease talking on the bus. Daniel, along with approximately 80+ others, spent a week together in activities from zip lines to Holy Powder Wars to science lab. Mid-point of the week was the only time specifically devoted to “telling your story” and was called “ENRICHMENT.” Daniel stated that it helped him a great deal not only to tell his story, but to hear others and not feel so alone with the feelings he has experienced during his mom’s journey…the family’s journey as well. The environment provided for sharing was seen as extremely comfortable. “I’m definitely going back! Everyone was so very welcoming and made me feel comfortable to talk about what happened,” said Daniel. Camp Kesem will hold 2-3 reunions during the year and Daniel and his family plan to attend. We thank Daniel for sharing his story and hope that his will inspire others to attend future Camp Kesem weeks.